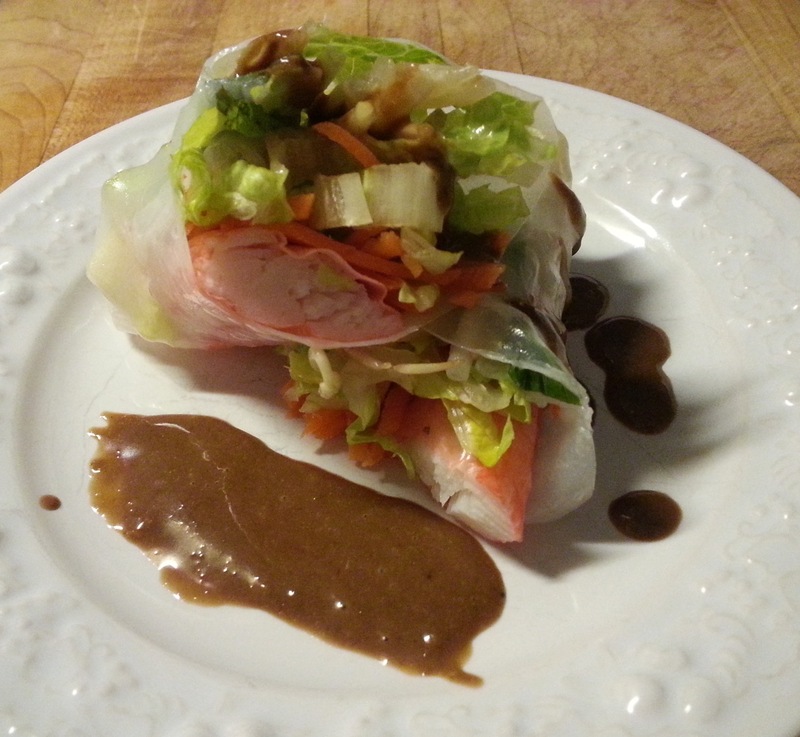 Chef John – To Eat Well is to Live Well! 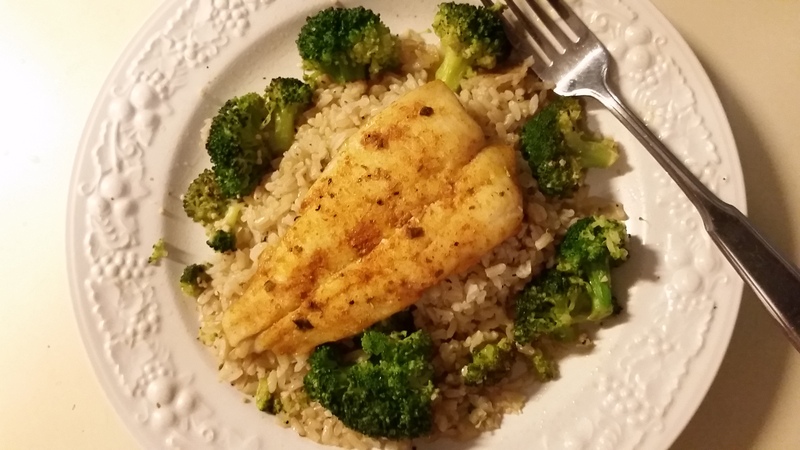 This was a meal I wanted to cook because my wife, per her doctor’s orders, has to try to eat gluten-free for the next few weeks and she really didn’t like anything she had found so far. I also wanted to do it for her just to cheer her up! So let’s go. 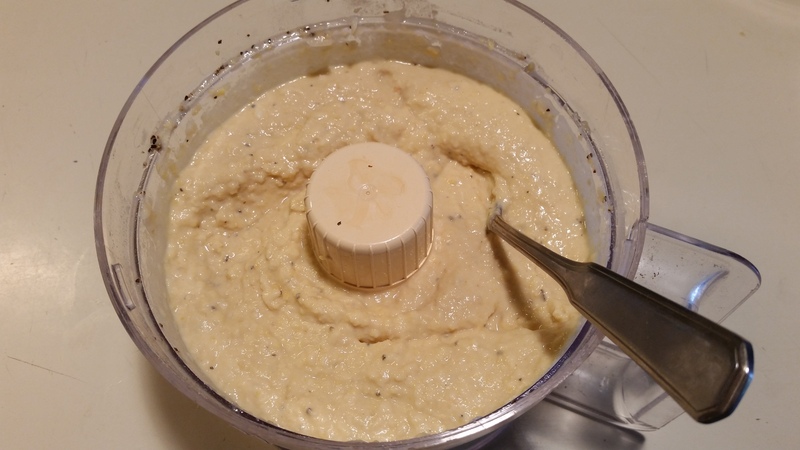 Mashed potatoes – potatoes boiled until soft, drained, then put back on the stove where you add a lot of butter and cream, some salt & pepper and beat them until smooth. Roasted carrots – medium carrots peeled, sliced in half, tossed in some olive oil, seasoned with some salt & pepper, tossed on a pan and put into a 400F oven until the edges start to turn golden brown. 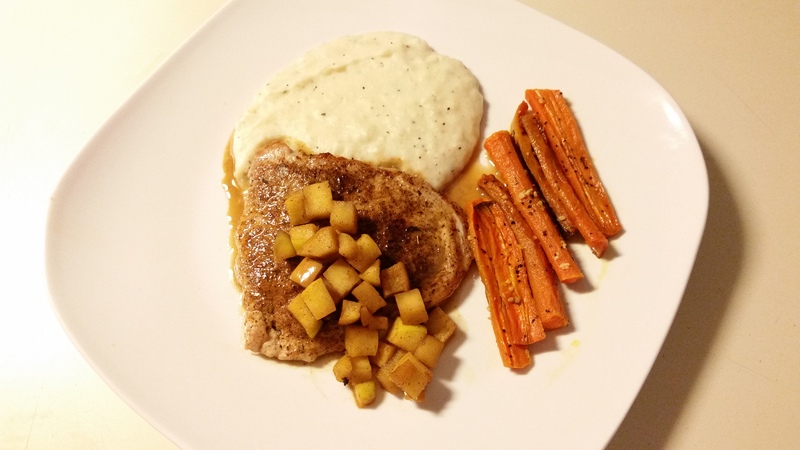 While the carrots are roasting, dice up an apple, put it in a bowl with 4oz brandy, 4 tablespoons of sugar, one tablespoon of cinnamon and let it hang out until after you cook the pork cutlet. Pork cutlet, last part, salt & pepper both sides cook in a medium hot pan with butter for a few minutes, turn and finish cooking until you have 145F internal temperature. 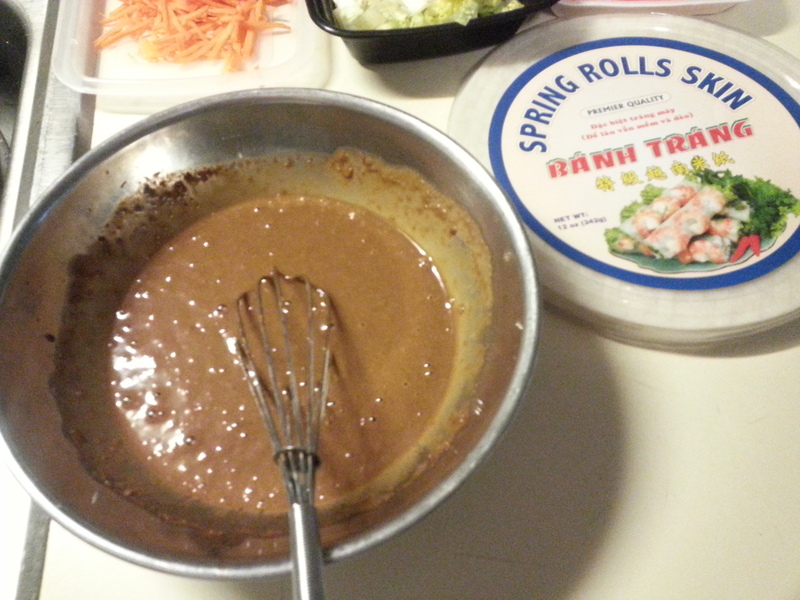 Take it out of the pan and set it on a plate with the mashed potatoes and the carrots while you make the sauce. Lastly the sauce, carefully pour the cup with the apple, brandy and seasonings into the hot pan, it might flame up a bit, stir all the tasty bits from the bottom of the pan left from cooking the pork. Let the apples cook for about 2 minutes while the pan sauce reduces. Turn off the heat and stir in a couple of tablespoons of butter and let them melt into the liquid in the pan. This should thicken the sauce a little. 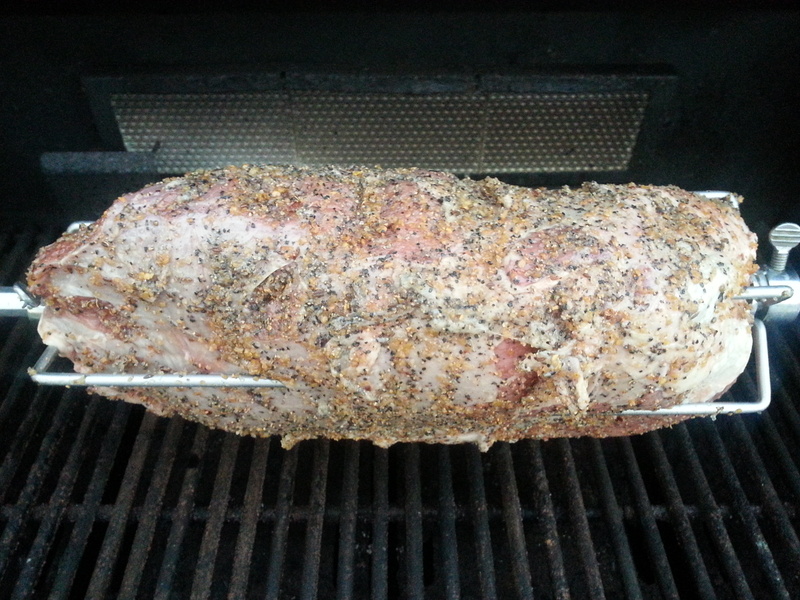 Check for seasoning and if all is good pour over the pork and enjoy a very delicious gluten-free meal! As a chef most people find it shocking when they hear that I am not a huge fan of mushrooms. Not that I dislike all mushrooms, I do really like a morel cream sauce. My wife’s family really loves mushrooms and while out at the farmers market we came by some beautiful portobello mushrooms. I love to make dishes with portobellos especially when others enjoy them. These are easy to make and you can make them ahead of time so you can spend more time with your guests. You can make them in gigantic portobello mushrooms like I did this time or regular white button mushrooms; the stuffing would be the same in either case. So let’s get to it. 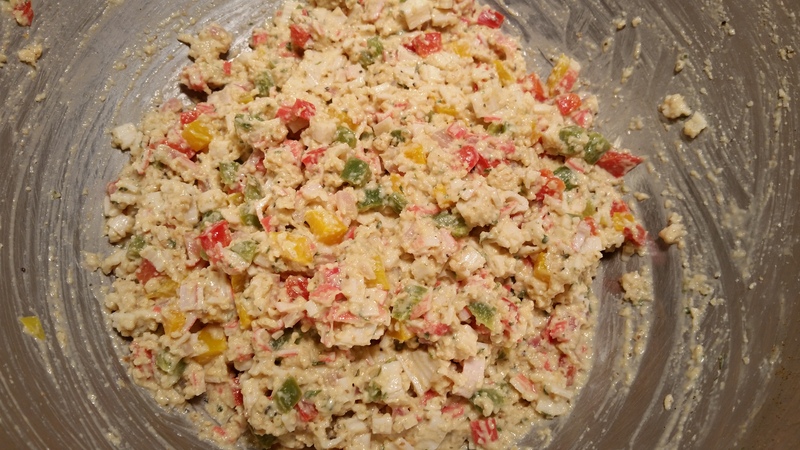 First off take a red, green, and yellow pepper and one medium red onion and dice it into small pieces add a tablespoon of chopped garlic, a couple shakes of Old Bay seasoning and some salt & pepper. 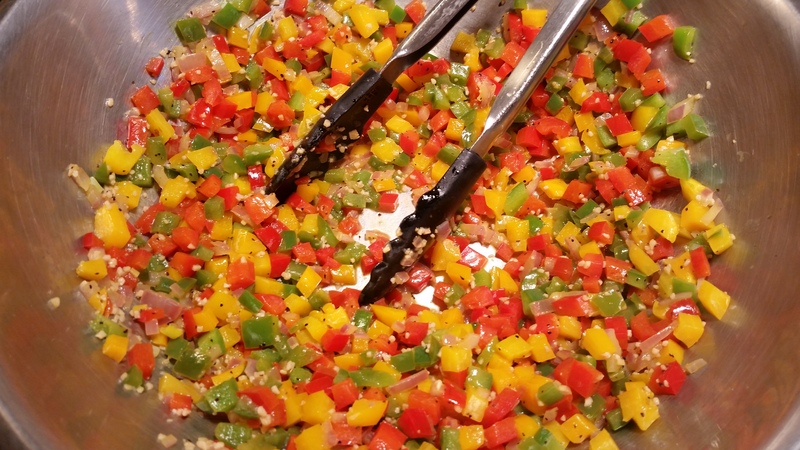 Add about ½ stick of butter to a sauté pan set over medium heat and cook the vegetables until they become soft. Pour them into a bowl to let them cool with 4 oz. 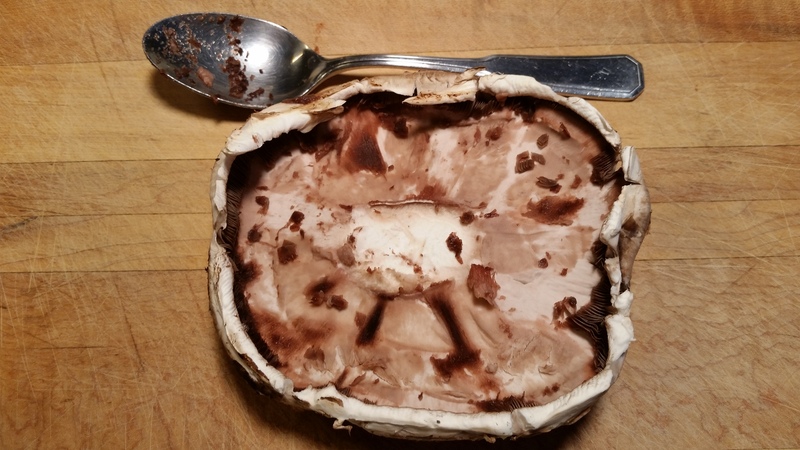 of cream cheese while you get the mushrooms ready. Remove the stems of the mushrooms, you can do two things now, you can fine dice it and put in the sautéed vegetables or just get rid of them, your call. I tossed them in this time. 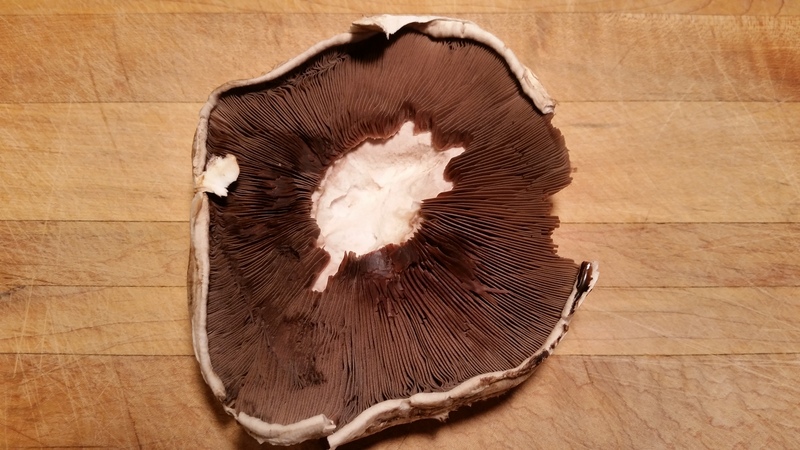 With a tablespoon now carefully scrape out the gills from the underside of the mushroom and discard them. You don’t want them because they taste bitter. 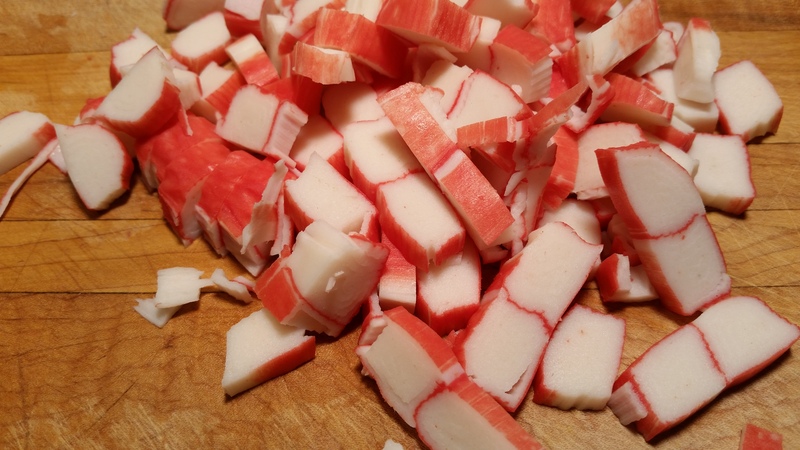 Now dice up the pound imitation crab meat, you want these a little large because they will break down when you mix everything up. 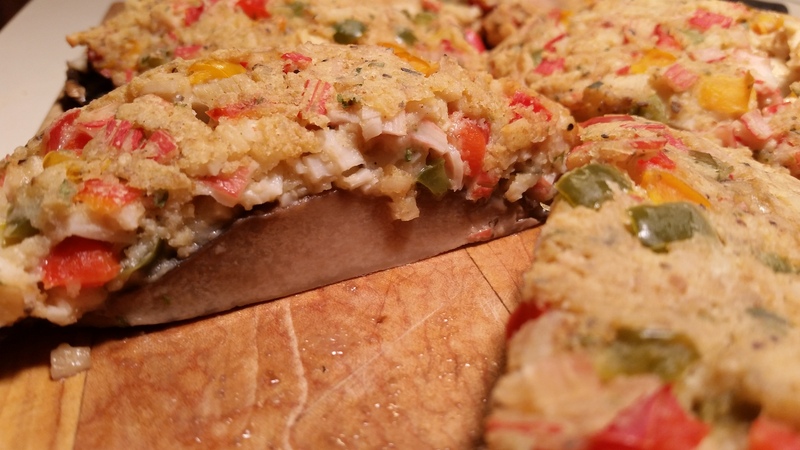 Toss the crab in the bowl with everything else and mix thoroughly. 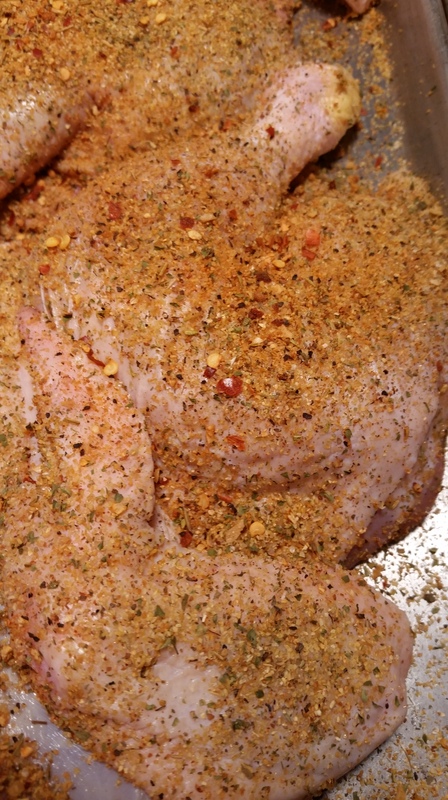 Here you might have to add some Italian bread crumbs to tighten up the mixture. You want the mixture to be tight enough to make a “slushy” snowball. In this case divide the mixture into quarters and place on top of the mushrooms. You can cover them if you want and stow them in the fridge for a day or two or place them into an oven preheated to 375F. 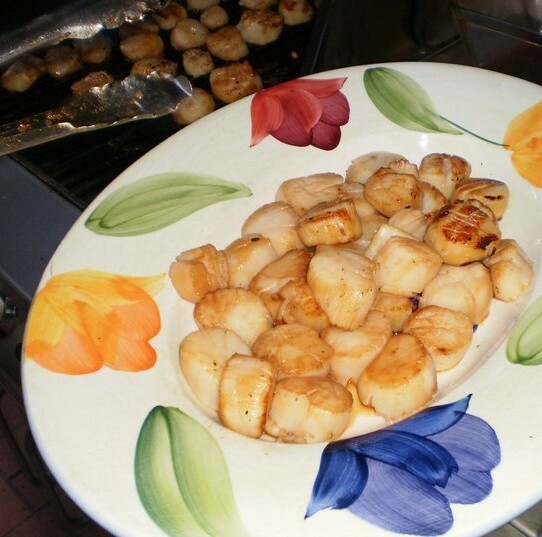 Cook them for about 20 minutes or until the top becomes golden brown. 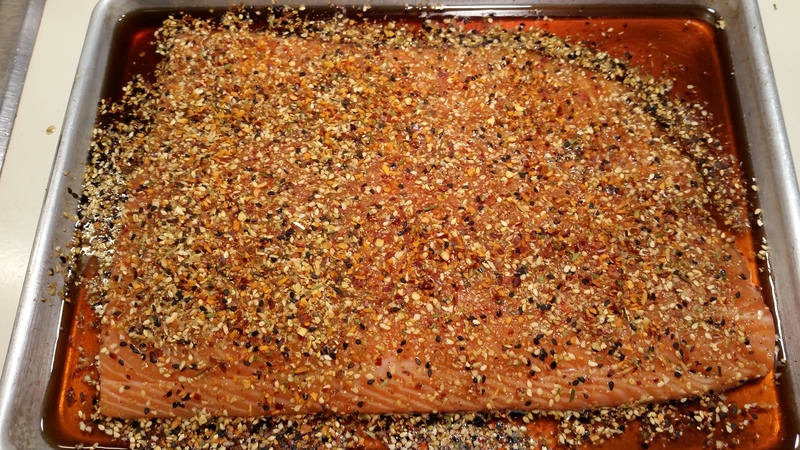 My wife does not like salmon so I thought I would serve her and her family some for dinner one night with the promise that she would like it. So here is how I did it. Start with the freshest piece you can get. 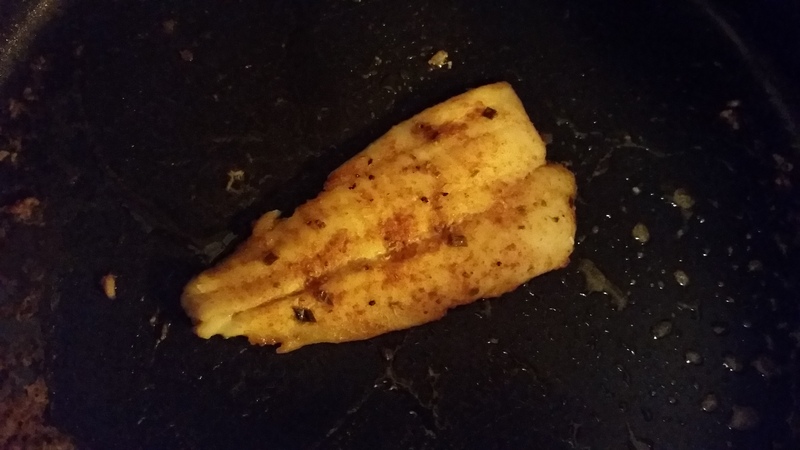 Next I cut the skin off just to make it easier to eat later. 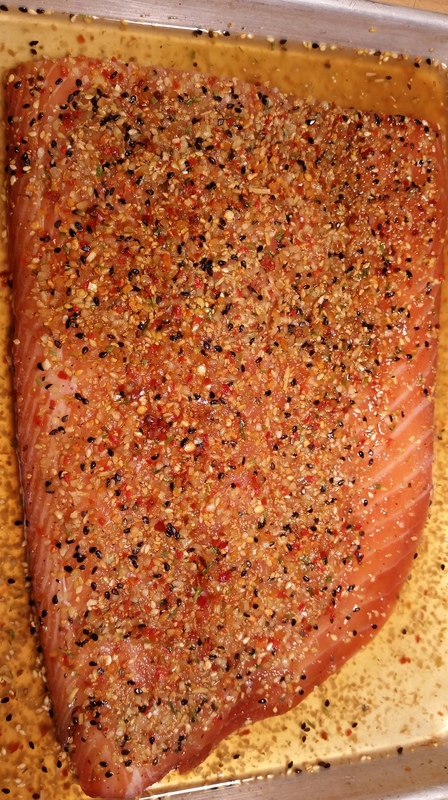 First, I would rub the salmon with some soy sauce, this helps the spices stick to the salmon. Next would be the spices in this case it was white and black sesame seeds, granulated garlic, pepper and some powdered ginger. 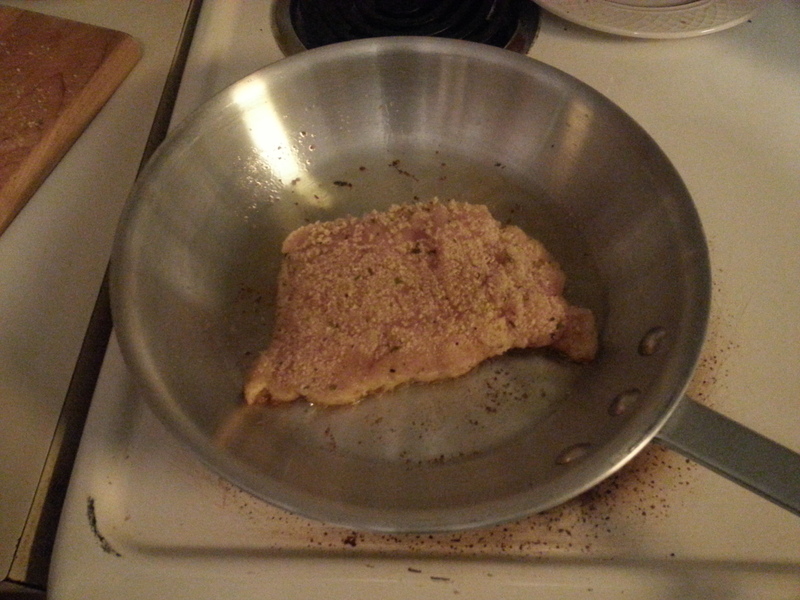 Push the spice mixture into the flesh of the fish. Now here is the kicker, pour maple syrup all over everything and let it sit in overnight. You don’t need a fancy or expensive maple syrup. 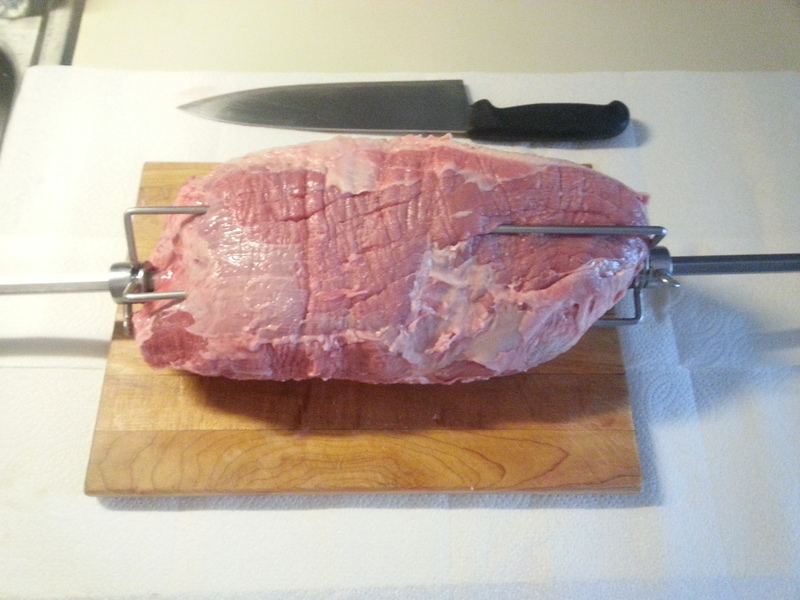 I also use it on pork loins when I smoke them. 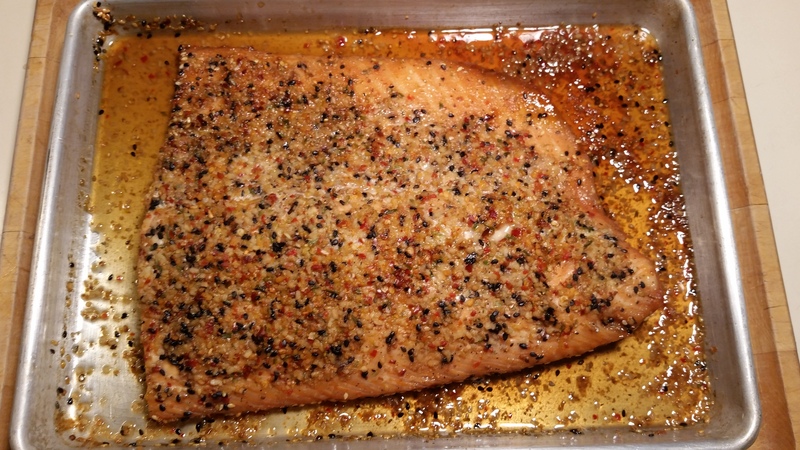 This will marinate the fish and help take away that “fishy” taste that my wife and her family don’t like. Cover and put in the fridge overnight. The next day let the fish come to room temperature, pour off the marinade and cook in a 300F degree oven until the flesh gently pulls apart. Everyone said they liked it very much and it must have been true because there was none left! 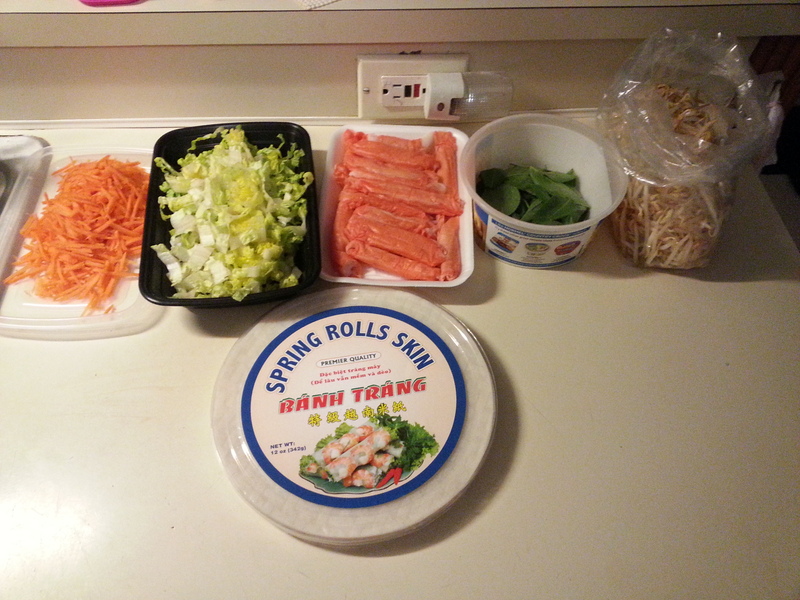 I like to mix things up a little, so for an appetizer, I thought I might like to make something healthy. My wife’s brother and his wife love hummus. I thought like to show them that you can make the same stuff for a lot cheaper than you can buy it, pre-packed in some plastic container at the supermarket. Also since you make it fresh at home, you know what is inside it. This also allows you to flavor it with anything you can imagine. So here goes classic hummus made in a minute when they were here. The main ingredient is chick peas. Regular old out of the 16oz can, rinsed and drained chick peas. 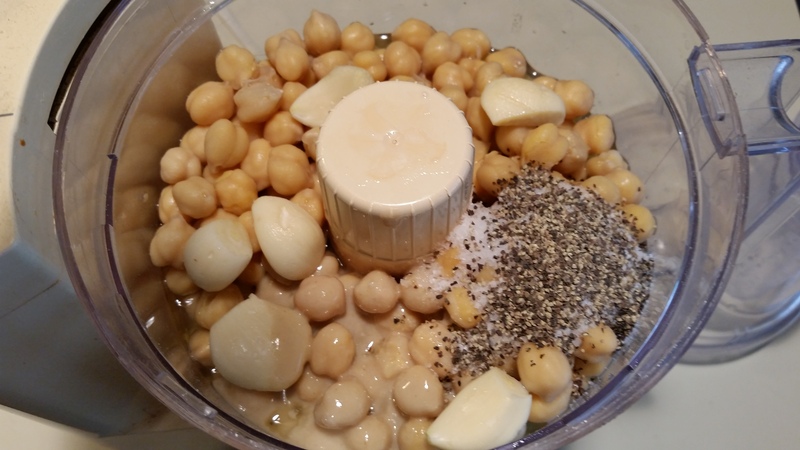 To that I added 6 cloves of garlic, 3 tablespoons of salt + 2 tablespoons of black pepper, 4oz of tahini paste, which is ground sesame seeds found in the super market, 2 lemons cut in half and the juice squeezed into the processor. Process on high for a few moments making sure to scrape down the sides so everything is thoroughly incorporated. You might have to add a little water if it is too thick. Adjust it to your liking. After that you should end up with something that looks like this. 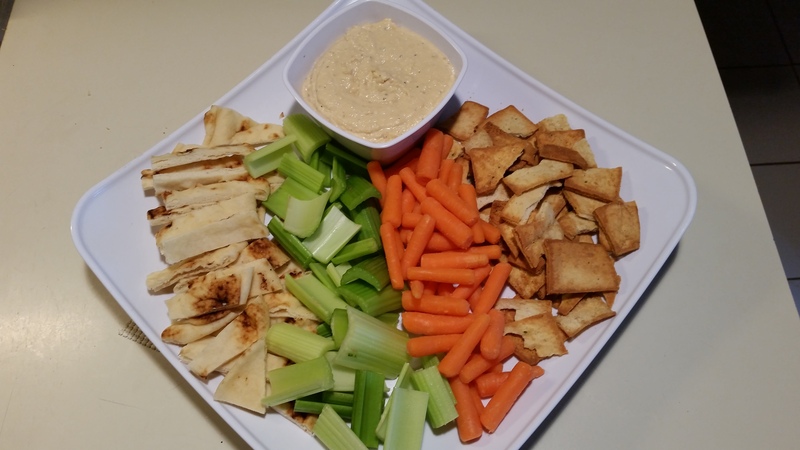 To serve, I placed some in another container had some fresh Nan bread, pita chips and some fresh vegetables arranged on a platter. 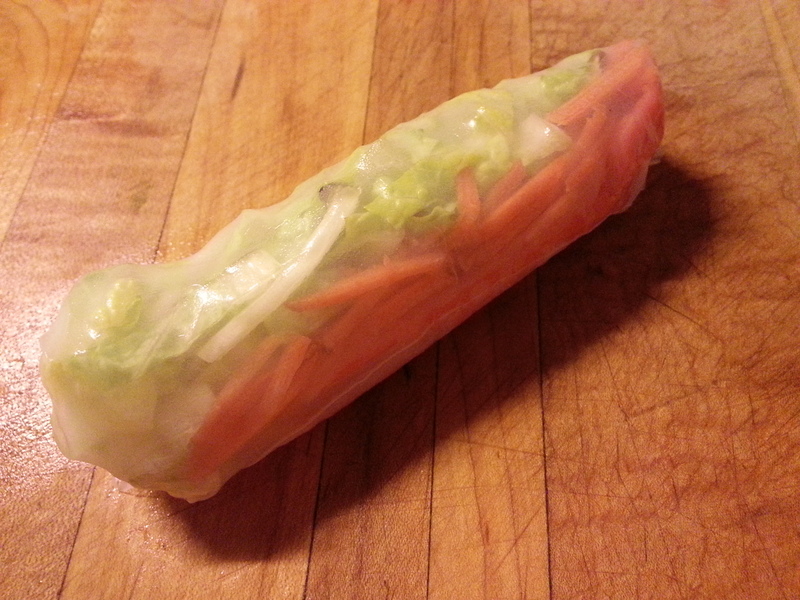 Everybody was impressed by how simple and tasty it was. Once again rummaging through the fridge, looking for some sort of inspiration for dinner, I found a little ham and cheese that was left over from making sandwiches earlier in the week and I knew I had some chicken in the freezer. So I said to myself, Let’s have stuffed chicken for dinner tonight along with some brown rice and some vegetable. 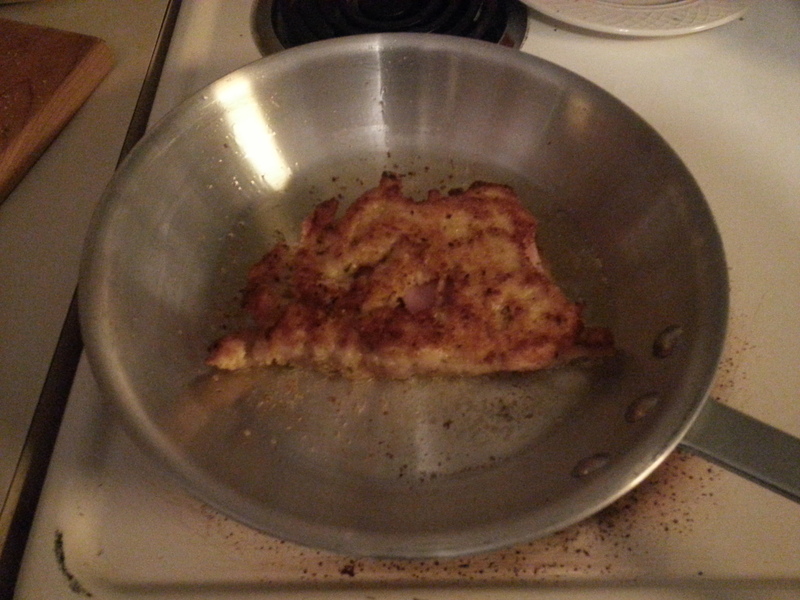 So here is how I made chicken cordon bleu that night. 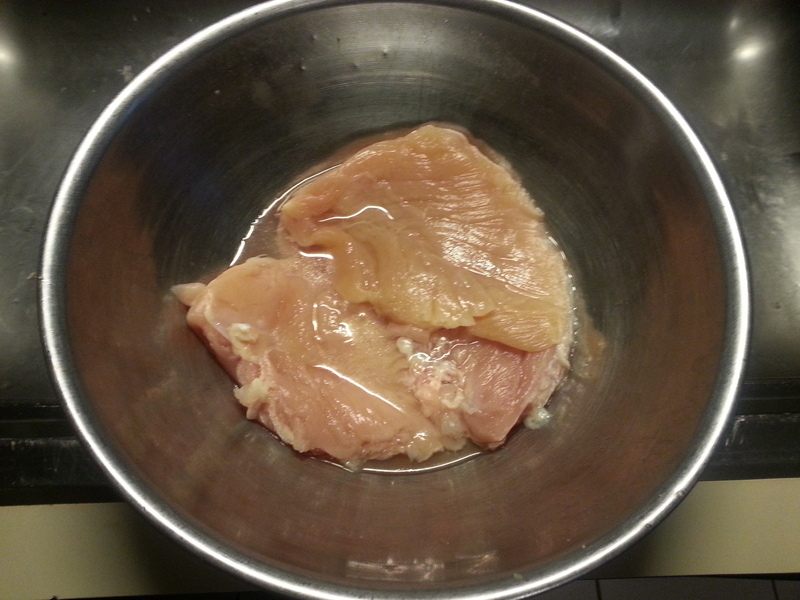 I took the chicken breasts out of the freezer and defrosted them under some running cold water. 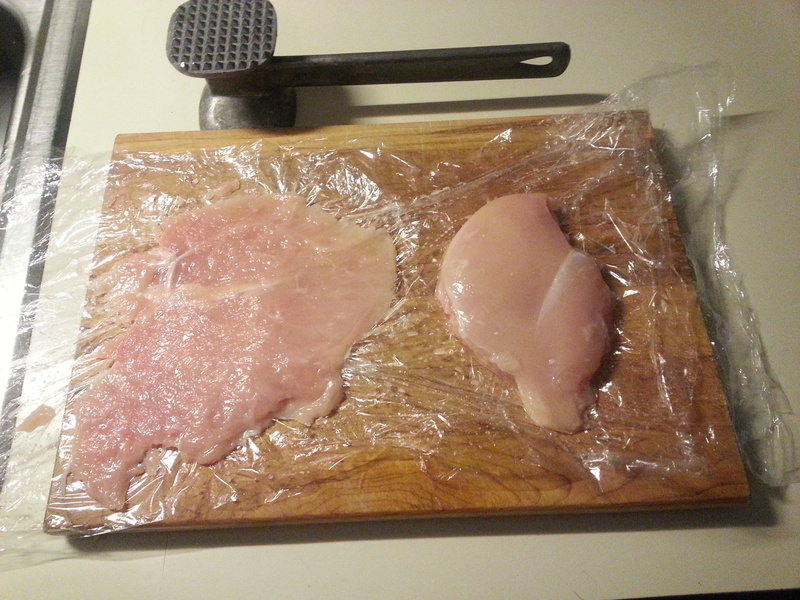 Using some doubled over plastic wrap, I carefully pounded the chicken breast until it was really thin. 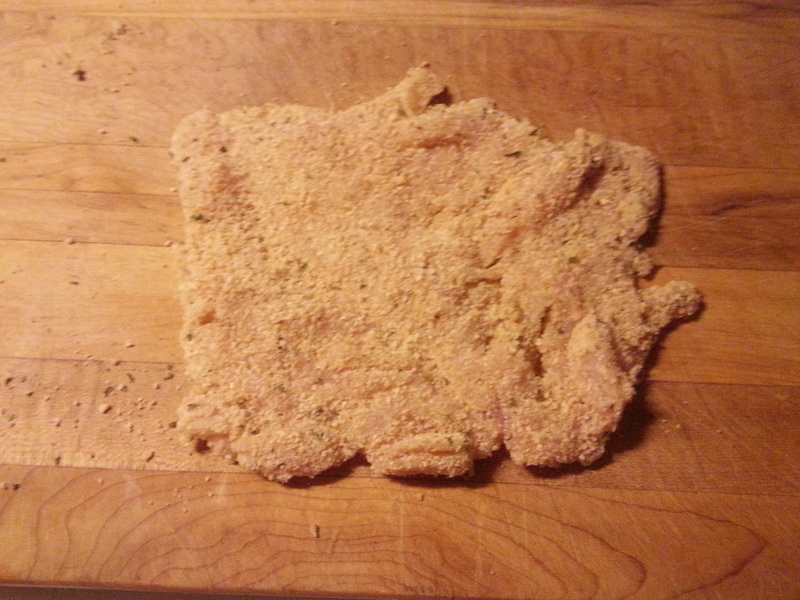 Then dredged it in some seasoned bread crumbs and set them aside. 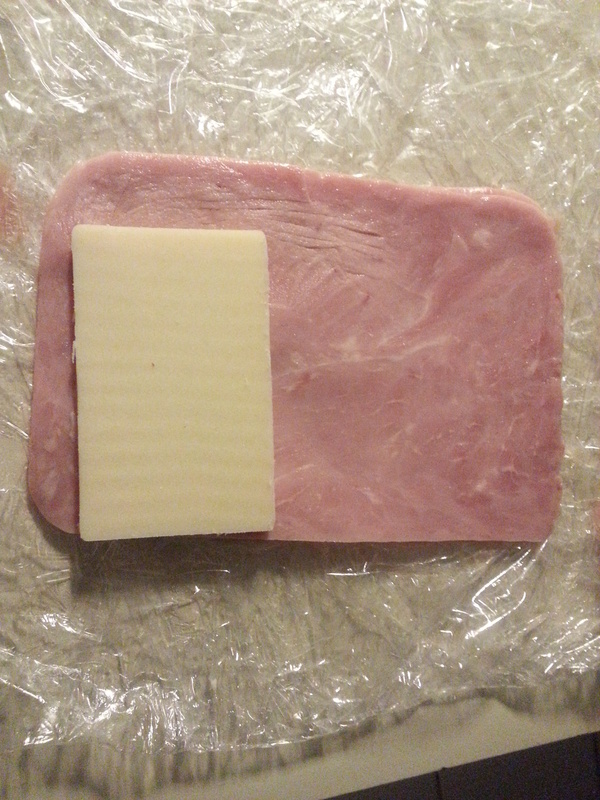 As you can see in the picture, the black forest ham is twice the size of the smoked Gouda cheese, but the cheese is twice as thick as the ham because I like it gooey. 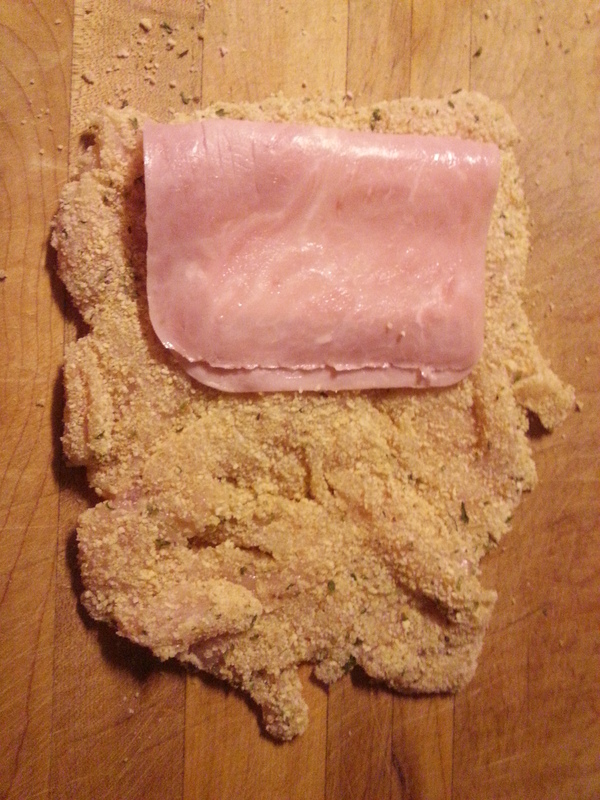 Fold the ham over the cheese and place it on one side of the pounded chicken breast, then fold the chicken over the ham so the chicken kinda seals the open part of the ham. This will help keep the cheese inside the chicken breast while it cooks. If you want you can use tooth picks to help keep the chicken together. Cook over a medium heat until golden brown about three to four minutes then carefully turn over to cook the other side for about the same amount of time. 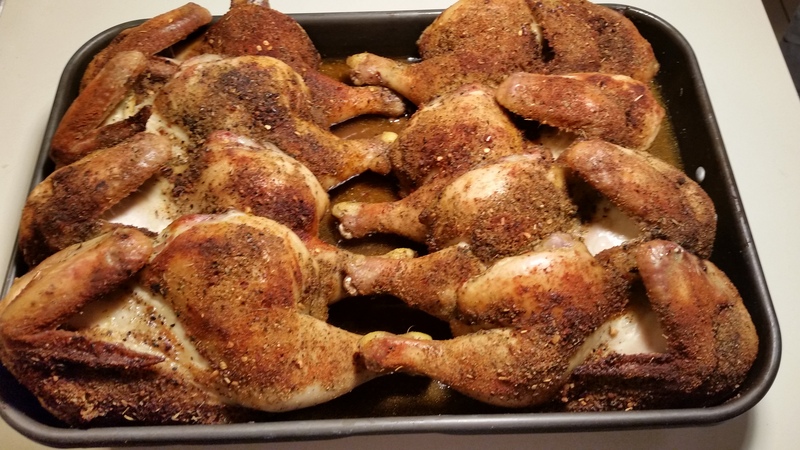 If you want, place the chicken on a pan and place it in the oven to keep warm while you make the rest of them, that is, if you have a big family or cooking for a lot of people. 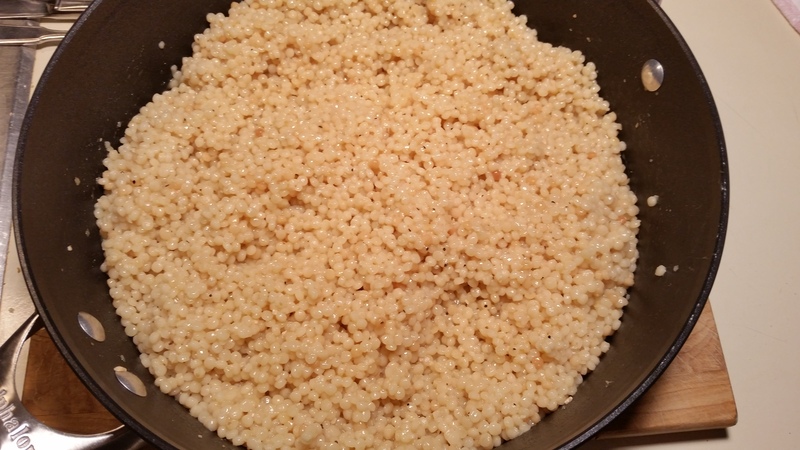 I like serving couscous in the summer, you don’t really have to cook it, you can make it a day ahead and you can serve at room temperature. So here is how I did it this time. I took a red onion, red, green and yellow pepper and diced them pretty small and sautéed them in some good olive oil with some salt & pepper and chopped fresh garlic. Put that in a mixing bowl to cool while I cooked the couscous. I like the Israeli couscous because it is bigger than the regular one. 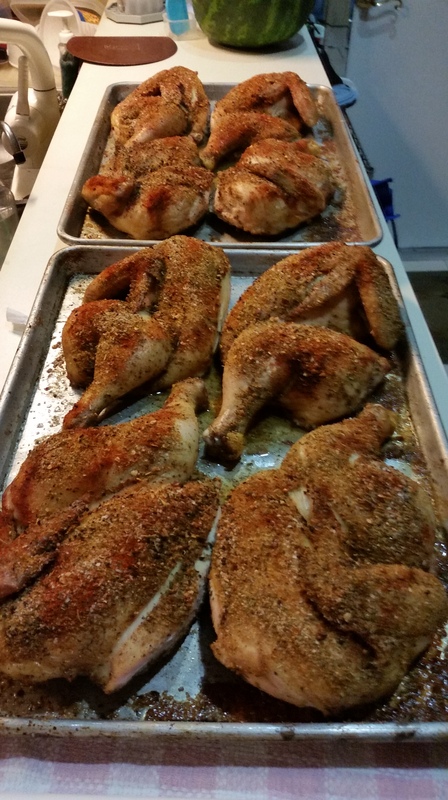 I used two boxes this time, cooked with chicken stock instead of water for extra flavor. Cook per the instructions on the box, just be careful not to over-cook it because it will turn to mush and you really don’t want that. 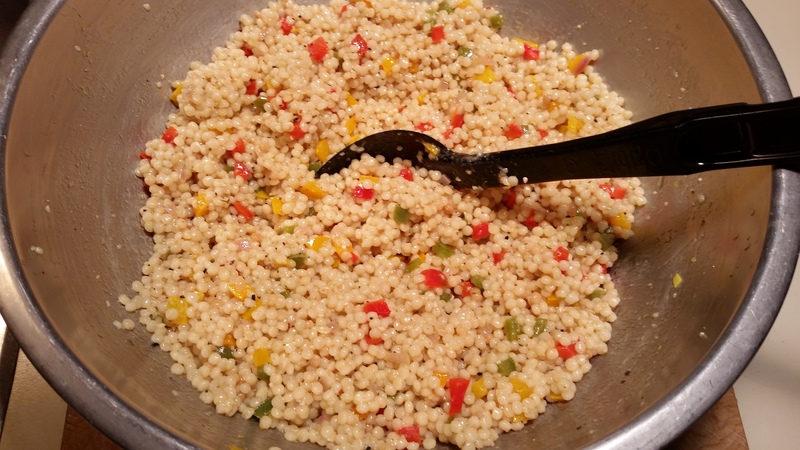 Take the freshly cooked couscous and combine it with the onion and pepper mixture. 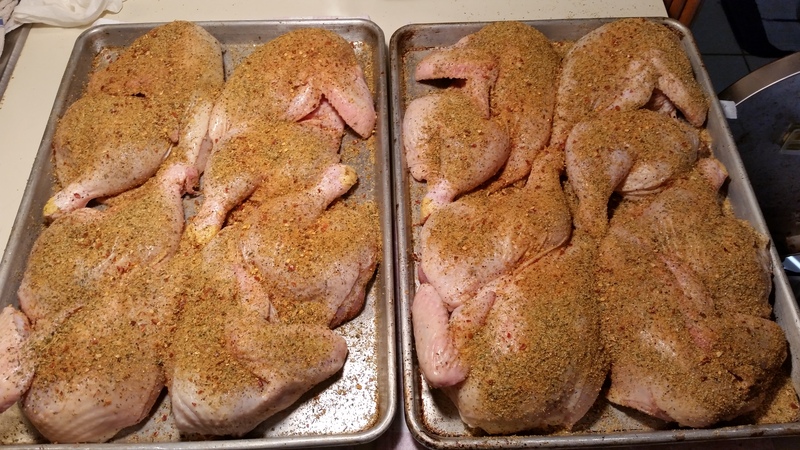 Here you might have to add a little olive oil and check your salt & pepper seasoning. 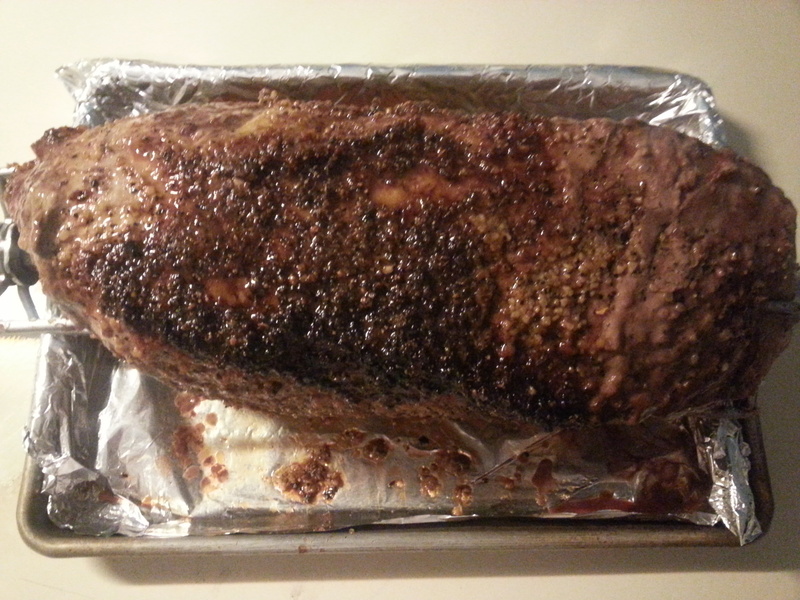 Let it cool and then cover it and store it in the fridge.